You have so much going for you today, because so much has been given to you by God. You have the fullness of His grace, the bounty of His mercies, the greatness of His power, the beauty of His presence, and the wonders of His love. You have been blessed with the fellowship of other believers, the revelation of the sacred scriptures, the daily intercession of Jesus Christ, the watchful ministry of heavenly angels, and you have been given the precious promises spoken from the heart of God. God's promises are like golden apples given to you in baskets of silver, providing a treasure of priceless worth. They are like an oasis that you've found in the desert, bordered with lush, date-bearing palm trees, and surrounded by pools of pristine water. They are like a feast offered to you on the banqueting table of the King, loaded with fresh bread, the finest wine, food fixed to perfection, and desserts that are a delight to taste. Any promise that is made to you is only as reliable as the character of the one who made it. People can promise many things that they are unable or unwilling to do. God is not like that. Every promise that He has made is sure and certain. God's promises are completely reliable because God is completely dependable. The God who created all there is, stands behind all He has promised. God's promises are true because God cannot lie. Truth is part of God's nature and character. God doesn't only know truth or have truth, He is Truth. God never wavers between "yes" and "no" when it comes to fulfilling His promises. In Jesus Christ, God has already said yes to every promise He has made. 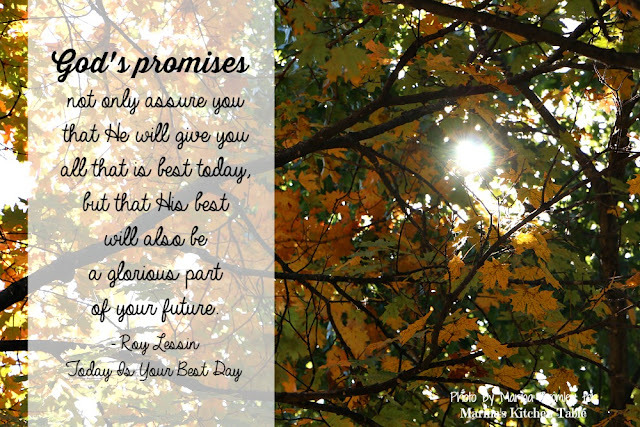 God has given you His promises because He wants you to know what is in His heart for you today. If you are in conflict, there are promises of peace. God's promises not only assure you that He will give you all that is best today, but that His best will also be a glorious part of your future.